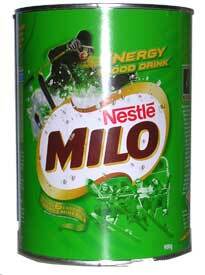 Milo is a nutritious chocolaty drink made from malted barley that the whole family loves. Milo is packed full of energy and contains minerals and vitamins including iron, calcium, vitamins A, vitamins B1 and vitamins C which are needed as part of a healthy and balanced diet. Extract of Malted Barley (16%) and Rice or Wheat or Barley (total extract 34%), Milk Solids, Sugar, Cocoa, Palm Oil, Mineral Salts (Calcium, Magnesium, Iron), Maltodextrin, Vitamins (C, A, BE1, BE2), Flavour, Emulsifier (Soy Lecithin).